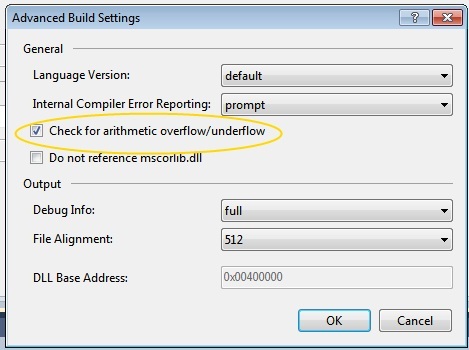 By default, when an overflow occurs as a result of an arithmetic operation on an integer type, the result wraps. You can also make a change to your project so that the default behavior is to throw the exception, even without the checked keyword. Go to Project Properties, click on Build tab, then click on the Advanced button at the bottom of the window. This brings up the Advanced Build Settings dialog.